Architect designed, modern beach house. Under 4 hours north of Sydney and less than 2 hours from Newcastle is the beautiful, unspoilt village of Seal Rocks. 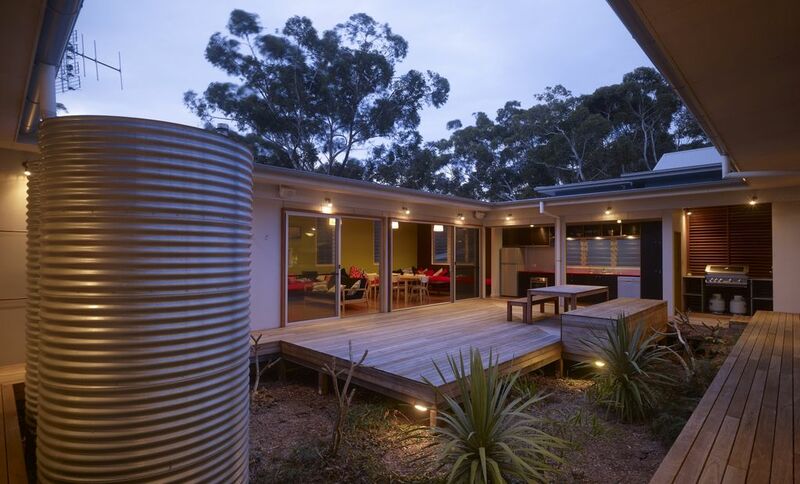 KURREKI, is a modern interpretation of beach house architecture by Bourne + Blue Architecture. Sleeping up to 7 adults in comfort, KURREKI, is ideal for families or a group of friends to experience the surfing paradise of Seal Rocks and Treachery. Sleeping accomodation at KURREKI is made up of two double bedrooms with queen size beds and a large bunkroom with three bunks. The living/dining area, bedrooms and bathing area all open to a private internal deck and garden. All bedrooms have wall mounted fans and mosquito nets so you can enjoy the experience of luxury camping, lying in bed and looking out at the stars. Your conscience will be clear as the house is solar powered, only rainwater is used and sewage is treated onsite with a wet composting worm farm. Spend your days hanging out on the hammock deck with a good book or get active and experience all that Seal Rocks has to offer. Surf the point break at No.1 Beach with the dolphins, go snorkelling off Boat Beach or take some time to go fishing. The nearby beaches face different directions, so offshore surfing conditions can be found year round. In the cooler months spend your time whale watching from the historic Seal Rocks Lighthouse or taking one of the many bush walks in the area. Or you could spend your days curled up in front of the fire reading, talking and watching all those movies you've been wanting to see. Kurreki can sleep up to 10 people with a maximum of 7 adults. As it is ideally suited for two families a great configuration is 4 adults and up to 6 kids. There is a highchair and travel cot available for your use. Bring your own bed and bath linen or contact kurreki@ to enquire about linen hire. Located in the small village of Seal Rocks, Kurreki, with bush views, is an easy walk to Boat Beach and No. 1. Treachery and Lighthouse are nearby. All have great swimming, surfing and fishing. Fisher & Paykel full size fridge with top freezer. There is always tea, coffee, salt/pepper, some spices, olive and vegetable oil. Please replace what you use. All kitchen utensils provided. At least 10 of each. if you are particular about your wine glasses it may be best to take your own. A limited number of videos for adults and children are provided. If you want to watch a particular movie it may be best to bring it with you. Please note - bring your own bed sheets, pillow cases, bath and beach towels. Doonas and pillows are provided as are extra blankets and hot water bottles for winter. Linen hire can be organised, please enquire - kurreki@gmail.com The nearest large supermarket is located in Forster. Smaller supermarkets are located at Buladelah and Blueys Beach. Small grocery items and fishing needs can be purchased from the Seal Rocks shop. My family loved our stay here. The house was clean. The eco experience was awesome and suited our search for a remote uncrowded surf destination. This pristine getaway will call us again. Fire place was perfect due to the drop in temperature, this was just another good experience that we don’t get in Queensland. Thanks for a lovely weekend at Kurreki. We love the house! Had a great weekend at Kurreki with another family - 5 adults and 5 kids. Plenty of room for all and suprisingly warm in the late Autumn evenings. Very well equipped with everything we needed. We have many friends who want to come and stay now after seeing our photos. Kurreki is a well-designed, uniquely-laid-out space that is ideal for a large (10) family gathering/holiday. The beach is an easy stroll away and the village of Seal Rocks is perfectly charming. The house is in need of some serious TLC and detailed cleaning, however. And the two, closely-adjoining houses are likewise set up for holiday letting, which means you may experience late-night parties close to your pillow space, as we did. Makes for grumpy kids (and their parents) the next morning. Would we recommend it? Yes. But I would speak to the agent and ensure that the house is properly cleaned (particularly the wet areas) and attention to broken cooking range dials and similar annoyances like blown light-bulbs and sticky roll-a-doors are replaced/fixed before you pay the hefty tag that is required. Fair is fair in both directions, I say. “Unbroken” money requires unbroken goods/services. Reciprocity. It's unfortunate that you didn't enjoy your stay at Kurreki in beautiful Seal Rocks. The driving rain and wind probably didn't allow you to fully enjoy the house or Seal Rocks but these things are out of our control. The weather conditions would have allowed you to make the most of the fireplace and the supplied fire wood though. The property on the same side as the children's bunk room is owner occupied so it is very unlikely that the neighbours kept any children awake particularly during an East Coast Low. Some people seem surprised that Seal Rocks is in the middle of a National Park. This obviously means no shopping centres / supermarkets or services and amenities that are taken for granted in urban areas. Every effort is made to repair or replace broken items in a timely manner but this also relies on guests reporting things they break or find broken. Unfortunately this doesn't often happen.